Before I'd started my own company, I was a Freelance Animatronics Designer/ Builder. 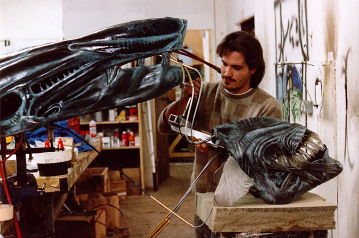 Stan Winston contracted me to work on the Aliens crew, and go to England to work on the shoot. 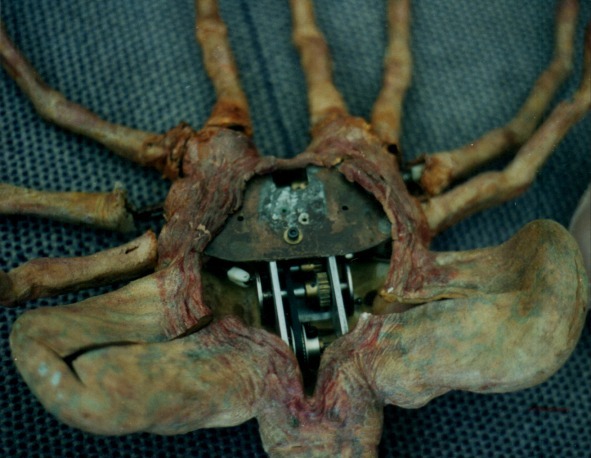 Among other things, I was entrusted with designing and creating the animatronics to make the face hugger run. After some initial experiments involving electric- and gas-powered motors, we opted instead for a wire-spool powered mechanism. A wire would be wrapped around an internal pulley, extended out front and back, and pulled taut. A second wire pulled the entire creature, the internal pulley would turn, turning gears which turned disks which "rowed", oar-like, the leg shafts. Offsetting the rotation of the disks gave the creature its spidery walk, and a reciprocating tail wag completed the mechanism. The leg speed would match the body travel speed; it could be pulled slowly for a creeping effect, fast for running; it could even "jump" if the front operator moved his end of the cable up and down rapidly. 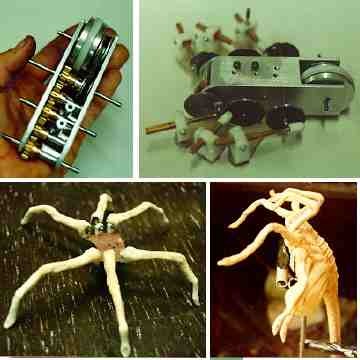 I also designed and built the "curl open" animatronics for the alien eggs on the film. This differed from the original "Alien" egg, in that 4 flat plates opened up. I used a cable stand-off on polypropylene technique to allow the petals/lips to curl back an seal back up organically. 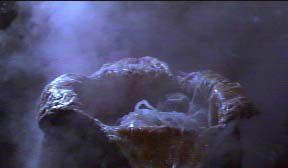 The Hero Egg I worked on was used in a number of shots in the film. 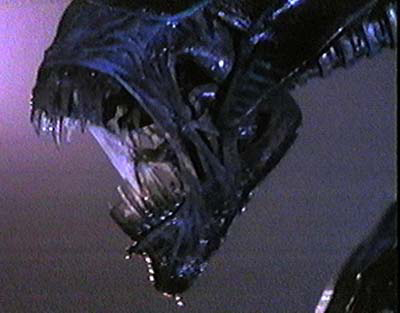 My other major responsibility on Aliens was to design the Queen's inner body animatronics. This picture shows me assembling the hero Queen head, which featured face up/down, face side/side, retracting lips, and retracting/extending inner "tongue", with folding/ extending teeth on the end of the tongue. All were cable controlled, while the neck motions were hydraulic, as built by Trevor Butterfield. To have been able to design and build "hero" components on the main creature for such a classic is something I'll carry with me a long time.